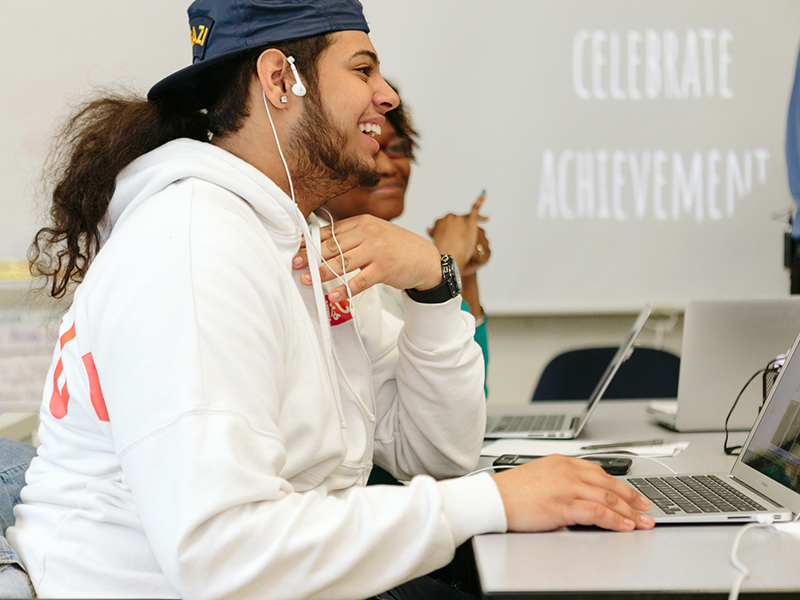 At Bronx Arena, each course follows a consistent instructional design model that requires students to complete two challenges and one capstone project to complete the course and earn a credit. This approach helps create a consistent experience and expectations for students across all course subjects, who know what to expect in any given course, no matter the subject. Throughout a course, students work through a series of activities that break down various pieces of content, culminating in a challenge. Challenges are summative projects designed for students to demonstrate their proficiency of skills they learned throughout that part of the course. After finishing two challenges, students work towards completing a capstone project, where students demonstrate mastery of content and the ability to transfer their knowledge to a new context. Challenges and capstones are created by curriculum design teams, which include multiple teachers and students. These projects have specific structures focused on competencies but are not overly prescriptive in order to allow for flexible application and demonstration of mastery. Each course has exemplars and rubrics that clearly illustrate to the students what needs to be completed to fulfill challenges and capstones, as well as the competencies and sub skills which need to be learned. Students receive challenge templates that guide them and help them complete each challenge. The templates include rubrics, which help them understand what they need to do and what they are graded on. Given Bronx Arena’s non-traditional structure, students are able to start a new class at any time during the year and work until they demonstrate mastery and complete the class. Completes two challenges and a capstone project to demonstrate mastery in each course and earn a credit. Accesses structural documents (e.g. challenge templates, rubrics) to help them demonstrate mastery in a course. Starts a new course after demonstrating mastery via a capstone in a previous course. Understands students' strengths and weaknesses for given competencies and courses, supports them as needed. Grades student work based on rubrics for each course. Houses data that shows student productivity and progress towards mastery within a given course. Houses student course outlines, providing them with structure and learning resources for each course.